Over Christmas 2011 & 2012 on Mill Road in The Tenters Dublin 8, the local residents have been delighted to behold the enthusiastic street art by an unknown artist. Time has been ticking by this year, and we’ve been concerned that our new Christmas greeting wasn’t going to appear. Thankfully, this was not the case. 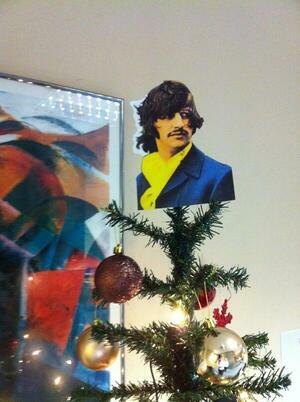 This proud & colourful seasonal greeting [above] was spotted this morning. A hearty welcome to the 3 wise dicks. Merry Dickmas, one and all! 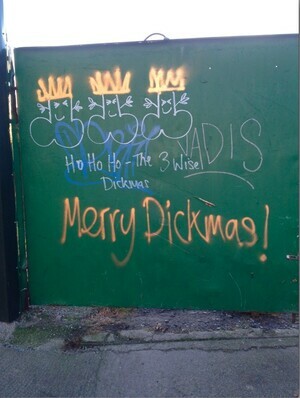 Posted in Misc and tagged graffiti, The Tenters, xmas at 11:32 am on December 9, 2013 by Broadsheet.